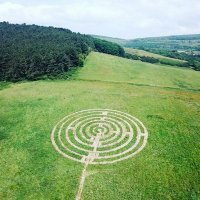 187 labyrinths found. Showing 81-100. Sorted by country, state, city, then zip/postal code. 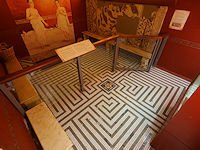 This replica of a Roman mosaic labyrinth, originally found at nearby Harpham in 1904, is installed in the reconstructed bath-house in the Roman section of the museum. Monday to Saturday, 10am - 5pm; Sunday 11am - 4.30pm. Open bank holidays (excluding Good Friday) and closed 24 to 28 December inclusive, and 1 January. 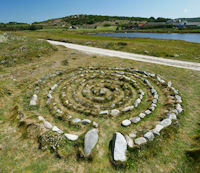 The labyrinth is located on top of a plateau in the quarry and is made from slat stone placed on the turf. 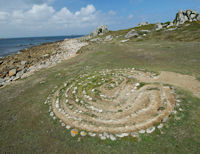 At the north end of the island, on the beach overlooking White Island is a collection of stone labyrinths of various designs, that come and go, as visitors build new labyrinths from the ruins of older examples. Currently around 5 or 6 are in good to reasonable condition. 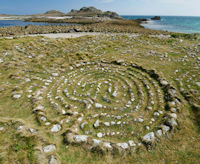 Various design types - some are true labyrinths, others are spirals and mazes. most between 5 and 10 metres. 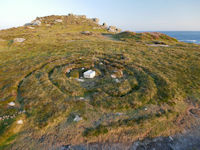 Situated beside the footpath that runs past the Giant's Castle promontory fort on the east side of the island, a short distance from the seaward end of the island airstrip. Just above the beach at Popplestone Bay, adjacent to the track that runs around the Great Pool. Located on the west side of the island, just north of Long Point. Originally built by Amor Clarke - so the story goes - but has been restored on several occasions since. Situated in the middle of the paved square in front of All Saints Church, in the centre of Kings Heath, at the junction of Vicarage Road and the High Street. 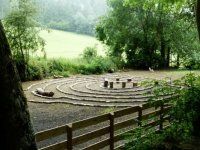 Inspired by a child's drawing of one of the church windows, this labyrinth draws on the mediaeval form and trinitarian theology to generate a unique threefold geometry in stone at the heart of the community's main public space. Along the route, 19 mosaics by Alison Ogle based on artwork produced in community workshops and 11 inscriptions drawn from secular and religious wisdom lead the pilgrim on a journey of discovery and reflection about life, death and rebirth. Please call or email to arrange a visit or come to Hazelwood House and enquire! Available from May 4th 2016 until at least July 1st 2016. Park in the small church car park (opposite the village green) and walk through the gate. Access to the labyrinth is over gravel, and the labyrinth ground is rather uneven; wheelchair access is possible but I suspect not very easy. Located facing the reception of the Liverpool Innovation Park. A 6 circuit Labyrinth designed by Gareth Price (www.reddoscar.com) for Head Gardener Roy's mother Rose in the summer of 2012. Cut into the turf and planted. 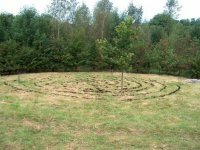 The Labyrinth has a diameter of 15 meters and the paths are designed for wheelchair access. Subject to occasional closure of stations and usual London Transport restrictions, eg not open Christmas Day, or overnight. 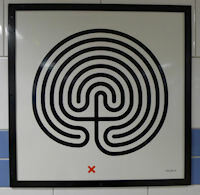 Finger labyrinths: Wide variety of different labyrinth patterns.